International Women’s Day has been celebrated in small ways since 1911, at a time when women did not yet have the right to vote. However, the day never garnered much attention before 1980 when President Jimmy Carter issued the first presidential statement on Women’s History Week. (Yes, it took that long for people to start to recognize the important contributions women have made throughout history.) Since that time, the day has grown into an entire month devoted to honoring our women heroes. 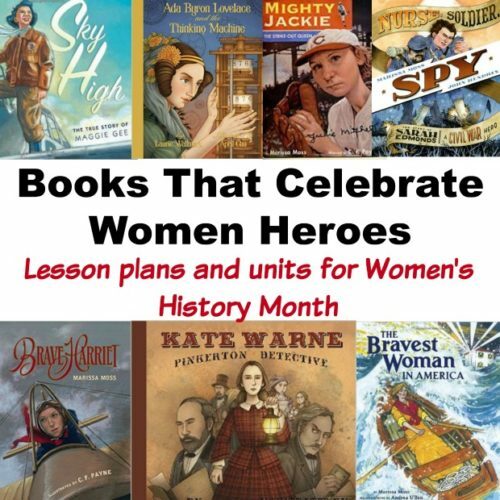 Books that celebrate women heroes is a great way to teach our children about Women’s History Month. 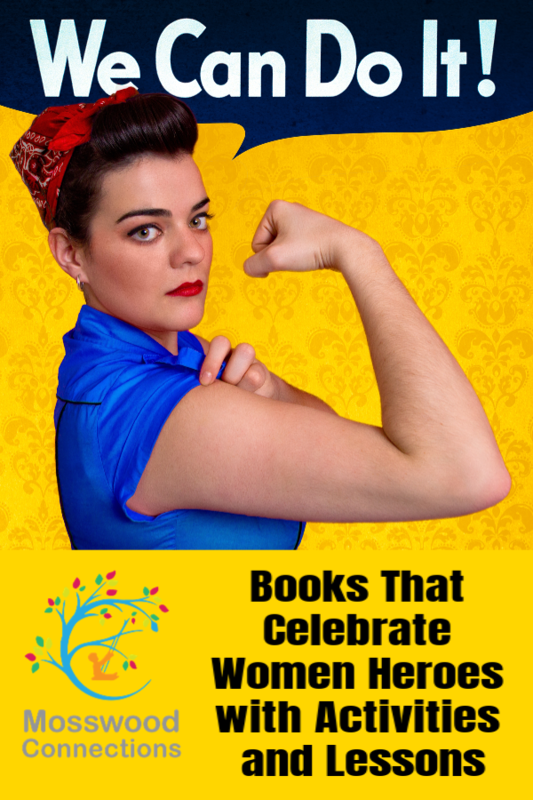 We found some fantastic books that celebrate women heroes. Women’s History Month is a perfect time to learn all about these amazing, often overlooked and forgotten heroes. Sky High: The True Story of Maggie Gee by Marissa Moss and illustrated by Carl Angel is one of my favorite books that celebrate women heroes. I may be a little bit biased because I knew Maggie and she truly was a woman of power: pilot in World War II, Congressional Medal of Honor recipient, chemist (at a time when it was rare for a woman to be a scientist) and political activist. She devoted her life to making positive changes in our world at a time when Chinese-American women were fighting stereotypes and prejudice. This lesson plan has activities and lessons that celebrate women aviators. Brave Harriet: The First Woman to Fly the English Channel by Marissa Moss and illustrated by C.F. Payne is another book about an inspiring female aviator. Harriet Quimby wants to be the first woman to fly across the English Channel. She is determined despite warnings from a fellow pilot. This book is a good addition to any unit on women’s history or aviation. Learning resources for Brave Harriet. Ida Lewis loved everything about the sea, so when her father became the official keeper of Lime Rock Lighthouse in Newport, Rhode Island, she couldn’t imagine anything better. Throughout the years, Ida shadowed her father as he tended the lighthouse, listening raptly to his stories about treacherous storms, drowning sailors, and daring rescues. Under her father’s watchful eye, she learned to polish the lighthouse lens so the light would shine brightly. She learned to watch the sea for any sign of trouble. And, most importantly, she learned to row. Ida felt ready for anything – and she was. There is a fabulous curriculum guide from the publisher, Creston Books. You may be surprised to learn that there was a woman baseball player who actually struck out the power-house player, Babe Ruth. For as long as she could remember, Jackie Mitchell’s father had told Jackie she could be good at whatever she wanted, as long as she worked at it. Jackie worked at baseball. She worked hard. And before long Jackie could outplay anyone in her neighborhood — even the boys. She had one pitch — a wicked, dropping curve ball. But no seventeen-year-old girl could pitch against Babe Ruth and Lou Gehrig. It was unthinkable. Then on April 2, 1931, the New York Yankees stopped in Tennessee for an exhibition game against the Chattanooga Lookouts. And on that day Jackie Mitchell made baseball history. This curriculum guide for Mighty Jackie: the Strike-Out Queen connects the readers to literature while developing reading comprehension. Ada Byron Lovelace and the Thinking Machine by Laurie Wallmark and illustrated by April Chu is the story about the woman who was the first computer programmer. Ada Byron Lovelace was the world’s first computer programmer-over a hundred years before the invention of the electronic computer. At a time when girls and women had few options outside the home, Ada followed her dreams and studied mathematics. I think that children may be surprised when they learn that it was a woman who coded the first computer and it is sure to inspire young girls to follow in her footsteps. Download the curriculum guide from Creston Books. Nurse, Soldier, Spy: The Story of Sarah Edmonds, a Civil War Hero by Marissa Moss and illustrated by John Hendrix is the remarkable story of a young woman who dresses up like a man to fight for the Union during the Civil War. This fast-paced, high-energy picture book tells the true story of Sarah Emma Edmonds, who at age nineteen disguised herself as a man in order to fight in the Civil War. She took the name Frank Thompson and joined a Michigan army regiment to battle the Confederacy. Sarah excelled as a soldier and nurse on the battlefield. Because of her heroism, she was asked to become a spy. A Soldier’s Secret: The Incredible True Story of Sarah Edmonds, a Civil War Hero by Marissa Moss is the story about Sarah Edmonds for older students. This historical Fiction novel follows the story of Sarah Edmonds in a more in-depth manner than the picture book. It is a great companion book for any unit on women heroes, women in history and the Civil War. This book lesson plan has activities and questions for both Nurse, Soldier, Spy and A Soldier’s Secret. Marissa Moss also provides discussion questions and a reading group guide you can use while reading the book. There are so many women heroes from history to learn about! There are so many good books that celebrate women heroes, these are just some of our favorites. Learn more about women heroes and 6 Queens You Should Know About for Women’s History Month. Perhaps you are interested in 10 Inspirational Sayings From Women Who Champion Equal Rights or 31 days of amazing women. There is a wealth of intriguing information and inspirational stories about women just waiting for us to discover. Do you have a favorite woman hero in your life?